Last week at the International Diabetes Federation’s World Congress in Vancouver, I had a chance to briefly reconnect with Elizabeth Rowley from T1D International. We talked about the #Insulin4All campaign and the work she and her team are doing to help provide access to people with diabetes around the globe, and how our online community can work together to improve lives across the globe. Today, she’s sharing some of her thoughts on how we can change the world for PWD. Thanks for taking the time to talk today, Elizabeth! 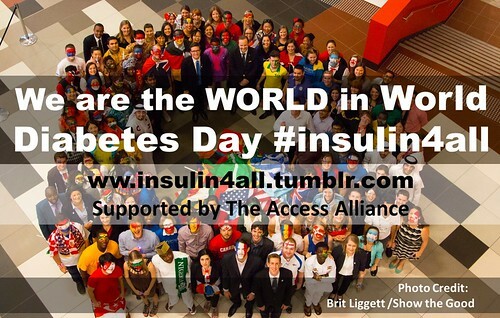 I see that the #Insulin4All was popular on World Diabetes Day again this year. Can you tell me more about that campaign? The #insulin4all campaign was started last year by a network of organisations called the Access Alliance that are passionate about access to insulin, diabetes supplies, care, and education for all people with type 1 diabetes. World Diabetes Day (WDD) started in 1991 in order to “draw attention to issues of paramount importance to the diabetes world” and has since become a huge day in the diabetes community for raising awareness about diabetes. The Access Alliance felt that while WDD is a wonderful thing, the true spirit of the day had been somewhat lost because people around the entire globe with diabetes were often forgotten. We wanted to do something more. So many people living with type 1 diabetes struggle to survive because they cannot afford or access their life-saving insulin, blood glucose strips, or basic healthcare. Others are caught in conflict where there is little humanitarian assistance for people with diabetes. The aim of the campaign is to unite as a diabetes and global community to show governments, companies, and individuals that we recognize the problems mentioned above. It’s important that we stand together to work towards tangible solutions. The campaign gets bigger each year around World Diabetes Day, but we want everyone to support #insulin4all every day of the year. The easiest way to support the campaign is by using the hashtag on social media and spreading the world about the issues. There is a lot of content on the Tumblr page and on the T1International website that you can share to promote and push for #insulin4all. 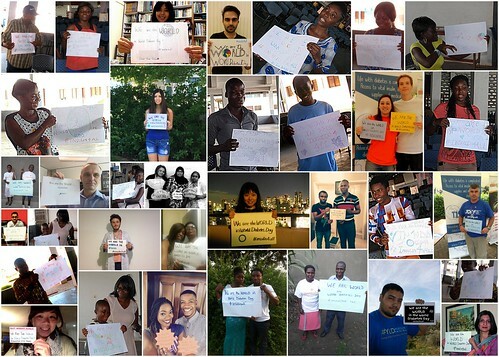 You can also still submit an #insulin4all image on the Tumblr page. All you need to do is take a picture of yourself holding up a piece of paper with #insulin4all written on it, submit it to the campaign page, and share it widely. How does this campaign bring the mission of insulin for all to a higher level and what is your goal? The diabetes community is a hugely powerful force and we have seen it unite to push for change from topics such as general diabetes awareness to access to CGMs. Many people with diabetes don’t realise that millions are dying premature death because they can’t access the basics that everyone living with the condition needs to survive. We want people to know that this is happening and we want to unite to change the situation. As with any change, the first step is to understand the problems to find the best solutions. The next step is building a force of advocates to ensure that change happens. That is what this campaign has already begun doing and will continue to do until everyone can live a full life with diabetes. What makes this campaign different from other insulin access efforts, like the 100 Campaign? The #insulin4all campaign is somewhat unique in that last year, for example, it had participation from people in over 40 countries around the world. It is very important to share the voices of others, especially those who are facing lack of access to insulin and supplies, and we are so glad to be able to do that through this campaign. We support the 100 Campaign and love its clear and powerful idea of 100% access to insulin by 2022. Despite the hashtag, #insulin4all’s focus is not only on insulin, but on all of the ‘pieces of the diabetes puzzle’. Even if you have insulin, for example, if you don’t have a syringe to inject it with, or a means to know your blood sugar levels, you’re still in grave danger. We feel strongly that all of these things need to be taken into account when building solutions. Do you think the diabetes online community has global reach and can make a truly global difference? Part of the issue we are bringing to light is that the diabetes online community is probably not global enough. This was certainly one of the motivations we had in setting up the campaign and the Access Alliance in the first place. We have been heartened to find that, as people learn about these issues, many are shocked and stunned – and they want to do something about it. We are confident that #insulin4all will grow the number of people that know about the issues and will therefore grow our power in numbers to speak out against the injustices. Yes, change is possible, but there are no easy answers or quick fixes when it comes to ensuring everyone around the world can obtain insulin, syringes, test trips, glucometers, and the diabetes education needed to keep them alive. That makes it even more important that we determinedly search for those answers and find appropriate solutions. It’s an ongoing process but it’s a vital one if we are to see the kind of change that is needed for our brothers and sisters with diabetes around the globe. “Life with diabetes is complicated. Access to vital insulin, diabetes supplies and medical care should not be.” If you agree, support #insulin4all today or get in touch with elizabeth@t1international.com if you want to get further involved. Thank you for sharing an amazing blog. It’s very useful blog you have shared.